Our awesome new mastery, Harmony, may take some getting used to. To assist, here’s a couple Power Aura strings that will help you keep track. The first aura shows a graphic and a simple timer than will count down the time left on your Harmony buff whenever it’s active. The second aura warns you when Harmony has fallen off by displaying an obnoxiously large exclamation point and sounding a sonar ping. It only happens when in combat. If you were to ask me what my most essential mod for raid healing was, I would say VuhDo, hands down (6 months ago the answer would have been Grid + Clique). 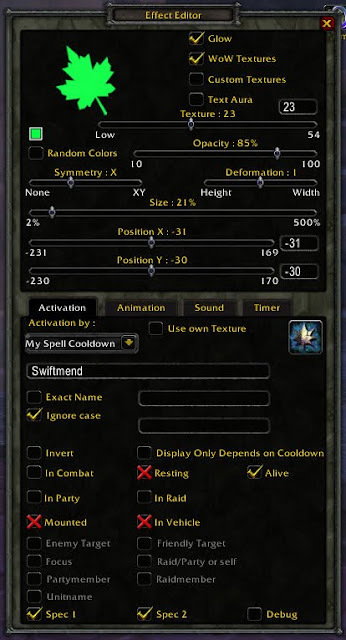 Besides providing an awesome set of compact raid frames that shows me everything I need to know, VuhDo includes spell click-cast bindings that you can set up however you want. A little while ago Beruthiel wrote a post sharing her bindings which I though was a fantastic idea, so now I’m going to share mine. I’ve tried healing in a number of ways. 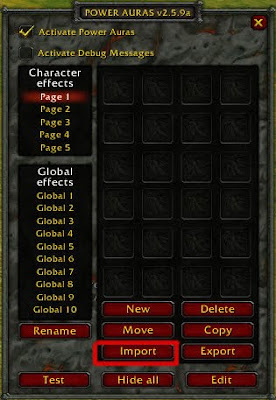 When I was a noob, I used to manually click on a raid frame then click on a spell (my god, how did I keep anyone alive? ), I’ve tried the method of clicking on a raid frame then pressing a keybind, but for the last 3 or 4 years I’ve been using click-casting. I’ve found this to be the fastest way to heal. You never have to worry about having the correct person targeted, just mouseover their frame, use the appropriate click+modifier and bam! they’re healed. My mouse is Microsoft wireless laser 7000 with 5 buttons. It’s not specifically made for gaming but it suits me just fine. My fiance recently bought the Cataclysm gaming mouse (that thing is HUGE, you need big bear paws to hold it – it reminds me of the original Xbox controller) so he have me his old Logitech gaming mouse. However, I’ve gotten so used to my own that it just didn’t feel right, so I continue to use mine. Since I raid on 2 different healing classes I need a good set of binds that will cause as little confusion as possible when I switch characters. Luckily, resto druid and disc priest spells are highly congruous so I’m able to bind similar spells to the same buttons. Bindings are made using a combination of the left and right mouse buttons (1&2) and the buttons on the side of the mouse (4&5) combined with the modifiers Shift, Control and Alt. I use my middle mouse button as my push-to-talk key for Ventrilo. I do not have any offensive abilities bound. Power Auras Classic is a very useful mod that gives you visual cues when certain events happen. It is insanely customizable and can be used to tell you when cooldowns are up, when procs happen, when buffs are missing and a hundred other things. I use power auras on my druid to let me know when certain spells are off coooldown and when I’m getting low on mana. All my auras are positioned closely around my character so they’re easy to see. Icon appears when Swiftmend is ready for use. Icon appears when Wild Growth is ready for use. Icon appears when Barkskin is ready for use. Icon appears when Nature’s Swiftness is ready for use. Graphic appears when I reach 70% mana, along with a radar “blip” sound. You can import any of these strings and make manual adjustments if you want to change the icons, colours or add sounds and animations. For more infomation on creating or modifying your own power auras see my UI post.